In recent years, the quest for "natural" food and ingredients in health and beauty products has been on the rise. Majority of consumers are now well-aware of the harmful effects of synthetic and man-made materials found in food, health, beauty and other household products. The absorption of harmful chemicals in the body is toxic. Over the years, the build-up of toxins could harm the body big time. Aside from mouthwash and toothpaste, all other personal and household products are not swallowed but there are other means to absorb toxins. The skin, being the biggest organ, accounts for your daily dose of toxin absorption. You pick these toxins from products that you rub or come in contact with your skin!. The toxins may build up in the blood, then the liver and could stay in your body for years causing a myriad of diseases. There are now special stores that sell all-natural products. I for one, have started to veer towards "green" products. On the rare occasions that I fed Tabby bottled food, I bought them in this special chain store that sells natural products at exorbitant prices. A small jar of baby food cost around 80 Php. If Tabby consumes 2 jars a day, that's 160 Php per day! There are plenty of 100% natural health and bath products for sale too but they cost too much! There are now specialty food stores that sell free-range chickens, beef cuts from grass-fed cows, gluten-free products, organic veggies and more at really prices way above standard market prices. It seems like, to be able to eat and use all-natural products, you have to shell-out a lot of moolah! Well, I can justify the high prices of all-natural products by saying it's better to spend money on food than on medical bills. Right? Right! 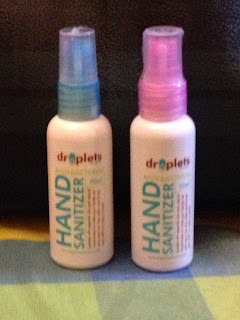 In connection, I found 100% all-natural hand sanitizer and dishwashing liquid by Drops of Nature, at really affordable prices. Note of caution. Be wary of supposedly all-natural products that are way too cheap. They are probably "fakes". Now why the heck should I go for 100% natural hand sanitizer when I could just use 70% ethyl alcohol. Well yes, I still have my "stash" of ethyl alcohol but as I tend to spray my hands with hand sanitizer many times a day, my hands become dry and flaky. Also, I would not want to sanitize Tabby's hands with ethyl alcohol. 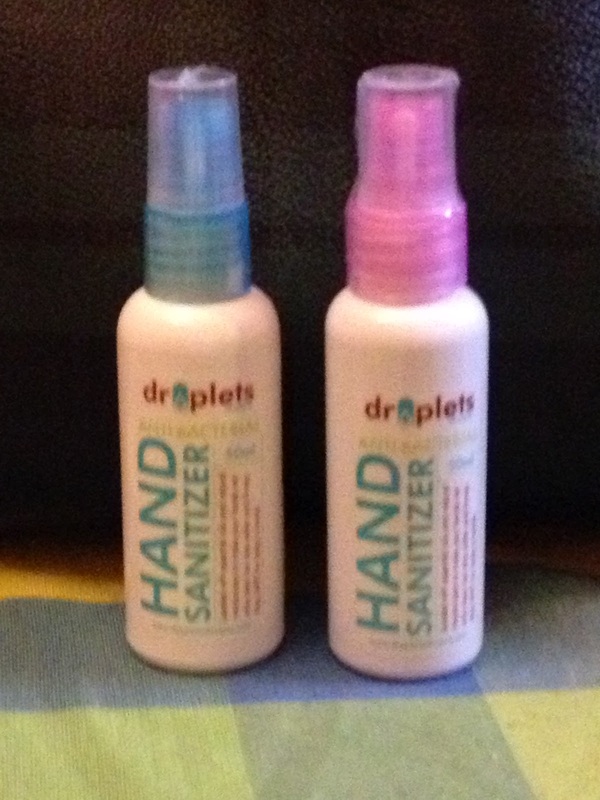 Droplets of Nature Hand Sanitizer is the product for me, Tabby, Ethan and the rest of the family. This hand sanitizer is from fruit-based alcohol. and plant-based lactic acid as the anti-bacterial ingredient. The essential oils in the formula act as natural moisturizers. This product is safe even for babies. They come in two scents : baby powder and mint. I like them both but I prefer the baby powder scent for Tabby. 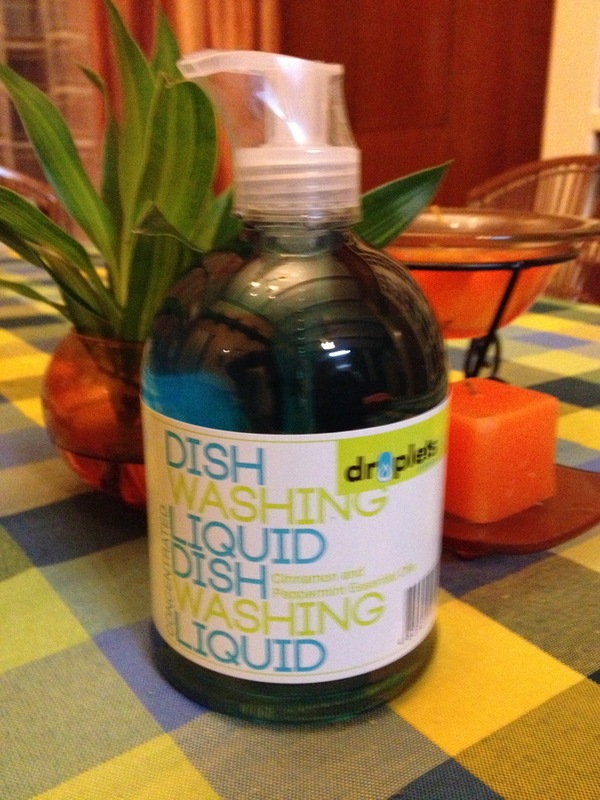 The other eco-friendly and 100% all-natural dishwashing product is the Droplets of Nature Dishwashing Liquid. Think carefully now. How many times in a day do you find yourself hunched-over the kitchen sink, washing the seemingly endless line of kitchen utensils daily? Right! Between ethyl alcohol and dishwashing detergents, your hand are bound to be shriveled by the ripe-old-age of 30! Yup! This dishwashing liquid is eco-friendly, cost-efficient and a moisturizer. * Eco-friendly - as its surfactant (the substance that stabilizes the mixture of oil and water ) is potato/corn-based. It is free from phosphate, paraben, sodium lauryl ether sulfate(SLES) and other synthetic chemicals harmful to humans. * Cost-efficient - as a drop of Drop of Nature dishwashing liquid is enough to clean 4 to 6 pieces of plates. * Skin and Ware-Friendly - great moisturizer for the hands and conditions extends the life of kitchenware as it's loaded with essential oils. I have my stash of these two Droplets of Nature products. You can buy yours online at Drops of Nature at Shopinas. 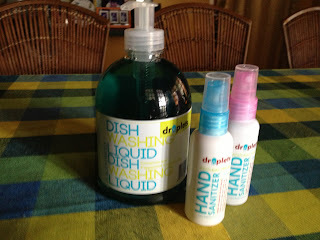 For more information and updated on their products, check them out in Droplets of Nature FaceBook Page. Want Your Baby To Star in His Very Own Johnson’s Baby Video? I like "green" products because I want to help preserve our nature even in just small simple ways such as using earth-friendly products. I also want to promote the use of our natural resources (the right way that is) as nature is one of God's best gift to us. I like green products because they help preserve nature. They also promote our natural resources.